Our first review on G Hotel Kelawai is during its topping off ceremony by Chief Minister of Penang back in year 2014. The ceremony was conducted on the highest floor – 24th floor in which the only thing available there is – cement. Recently, we re-visited the same floor again for Penang’s latest rooftop bar – Gravity. 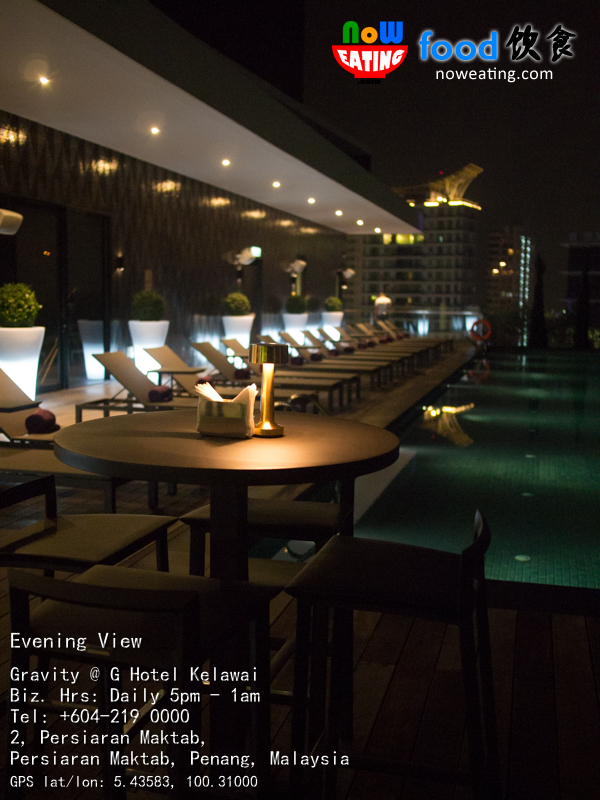 Adjacent to the picturesque infinity-edge swimming pool and private sophisticated Executive Lounge, Gravity helps to create an exclusive and chic atmosphere perfect for some relaxing drinks over a chat with business partners, friends or even the loved ones. 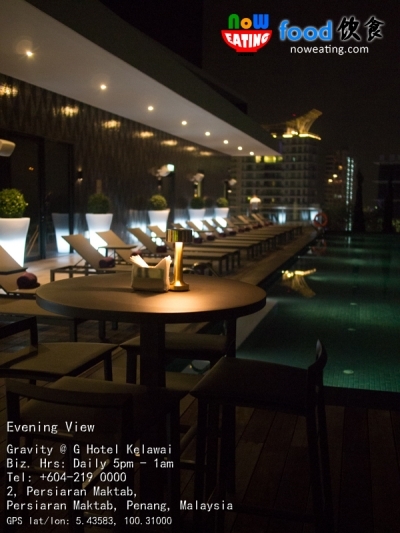 Gravity also rewards stunning 360-degree view of the island and the iconic Penang Bridge. 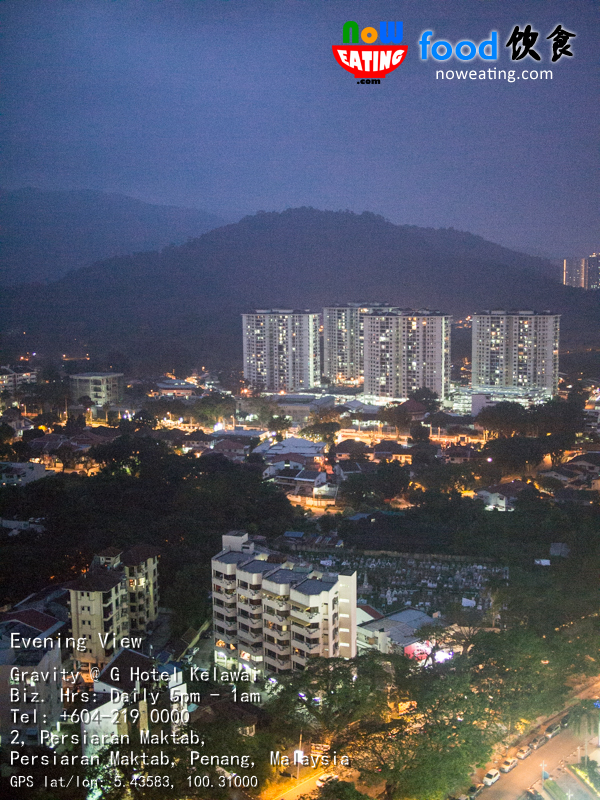 The night view is excellent as well. 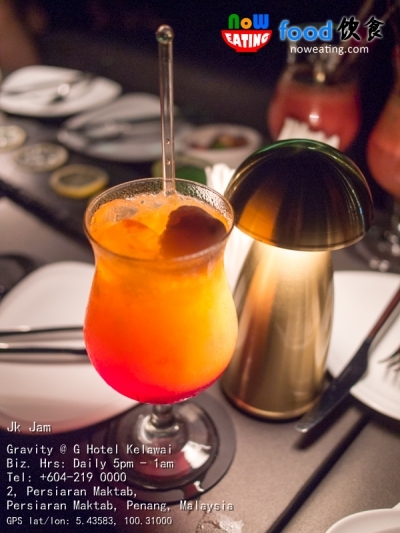 Gravity is famous with its cocktails (alcoholic) and mocktails (non-alcoholic) such as Pina Colada, Singapore Sling, Cosmopolitan, and the all-time favorite – Pomegranate Mojito (RM38). It is one of Cuba’s oldest cocktails with a twist. 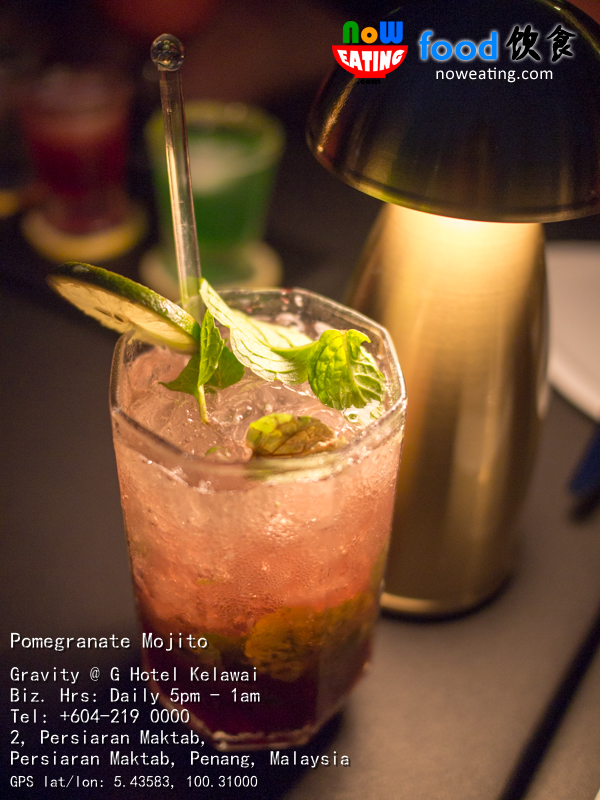 The Mojito is made of spice rum, pomegranate syrup, lime, fresh mint and soda water. Prefer non-alcoholic drinks? Try Gravity’s signature Jk Jam (RM21) with a blend of orange, mango, lychee, grenadine and lemonade juice that is so refreshing to the worn out souls. Satay Lilit Ayam (RM19) – Minced chicken with yellow spices, palm sugar on lemon grass skewer and chili sauce. Lumpia (RM19) – Balinese duck spring roll, Asian vegetables, coriander and sweet chili sauce. Gravity Rissoles (RM19) – Ground chicken breast, tomato and melted cheese on mixed lemon salad. Prawn & Watermelon Salsa (RM19) – Thai grill prawn U15 on fresh watermelon, feta, cucumber salsa. Come with empty tummy? Try the Gravity Burger (RM28) served with Brioche bun, beef or chicken patties, egg, sweet relish, tomato, lettuce and fries. 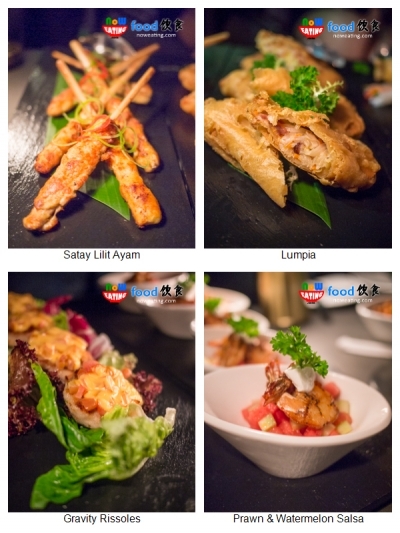 Alternatively, go for Gk Wings (RM28) made of smoked BBQ chicken wings, sesame seed on Asian salad. Also, it will be difficult to stop eating once you start the first bit on their wedges (RM15) and fries (RM12). As a whole, we enjoyed the food in Gravity as they were prepared at hotel standard (Gravity is in the hotel, after all) with nice food presentation. 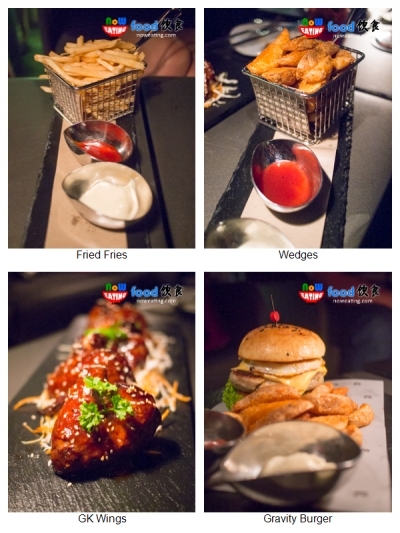 The less oily and mild texture reminded us of the food in the Tree Bar at the al fresco of Gurney Plaza, which is also under the management of G Hotel. 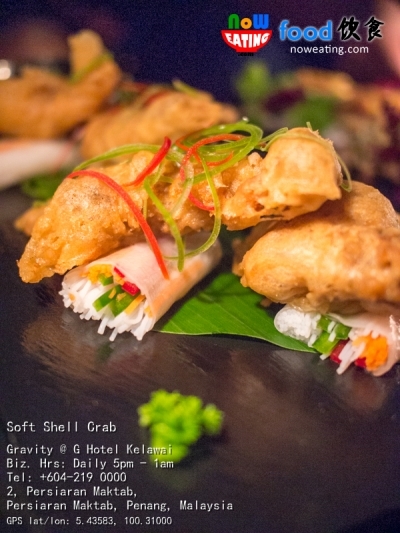 For those wishing to try the best of Gravity during their first visit, we recommend Soft Shell Crab (RM24) comes with julienne summer vegetable wrap. 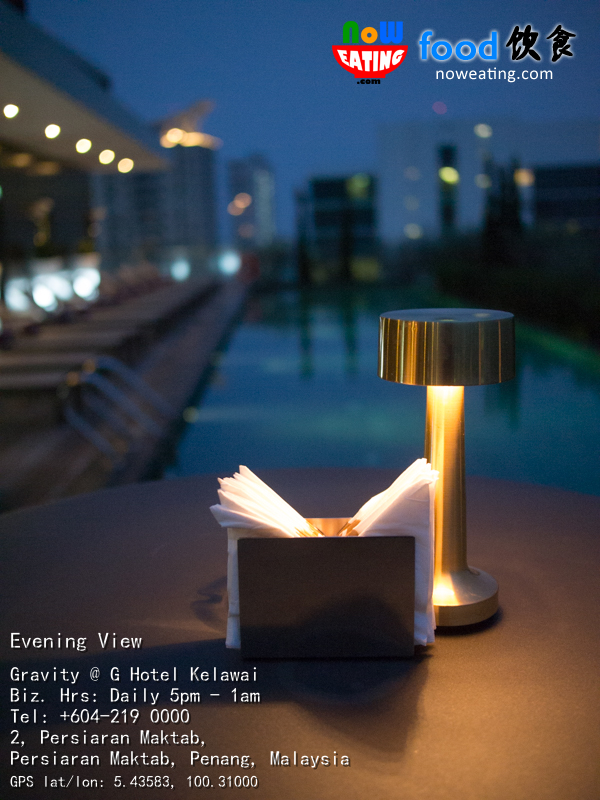 Even better, Ladies Night is held every Wednesday and Thursday nights from 8pm – 12am. 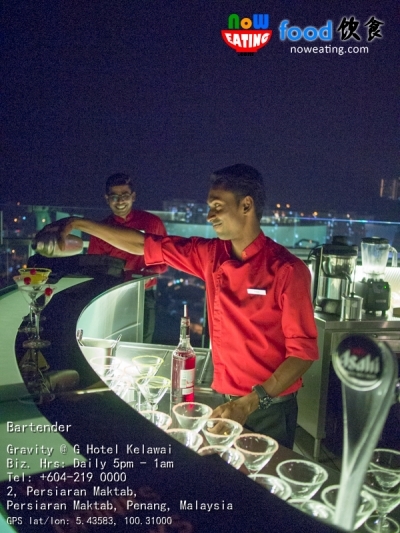 Girls will get a free glass of cocktail upon entry. All the guests are entitled for 50% off on the second glass purchased onward on selected drink. 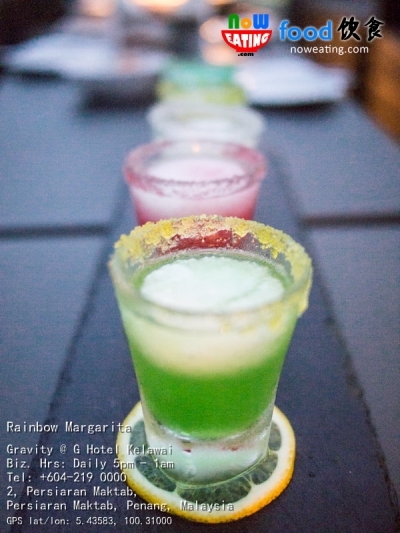 Happy Hour is available daily from 5pm – 7pm with buy one free one on all house pours. Also, Gravity is introducing Rainbow Margarita (RM26 per set) made of 5 shots that bring different hues and flavors to brighten up your night. 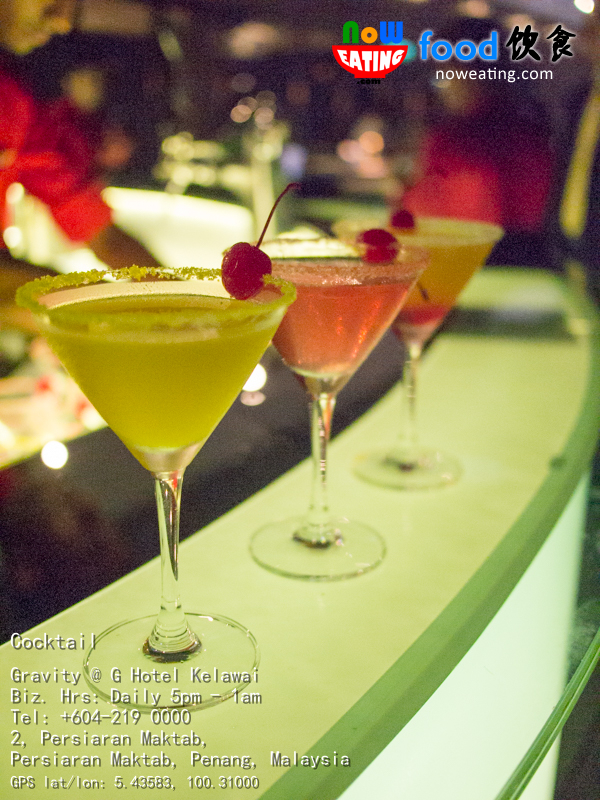 Gravity is opened daily from 5pm until 1am. 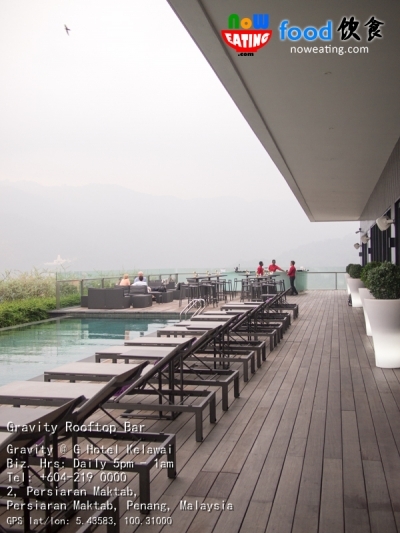 Please contacts +604-219 0000 for bookings or further information about Gravity.